Bertolt Brecht's work has always provoked heated discussion, though today he is viewed as principally a classicist and a rationalist. 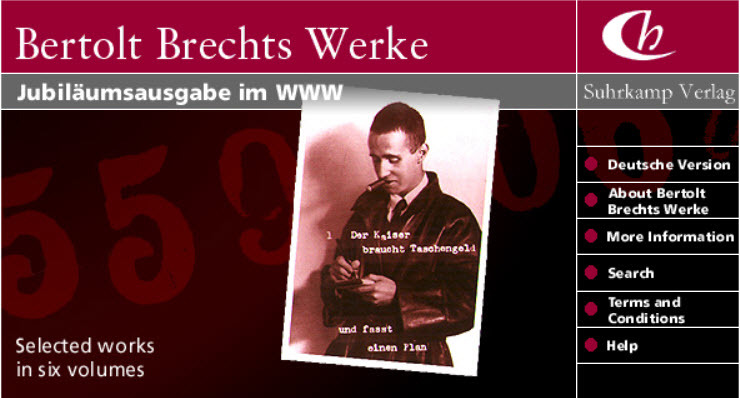 Bertolt Brechts Werke im World Wide Web is an ideal instrument for research and will revolutionise the academic study of Brecht's oeuvre. With his "descent into fame", Brecht became a classic writer. Max Frisch wrote of "Brecht the Modern Classic" as early as 1955, intending the term ironically - yet his dictum on "the classic writer's profound ineffectiveness" was not corroborated, in Brecht's case, by reality. Brecht is a classic writer; yet paradoxically he can also work as an "irritant", as Marianne Kesting writes: "Until his death and beyond, Brecht courted scandal. He was one of those fertile cultural irritants whose works and views spark debate wherever and whenever they find expression. His work will last, and continue to sit like a thorn in the flesh of our age." Why will this work last and be a "thorn in the flesh of our age"? In the foreword to his selection of Brecht's poems and songs, Peter Suhrkamp explains: "In his poetry and drama, Brecht laid down the history of the German people from 1918, a fact that is far too seldom acknowledged. Yet to anyone who really lived through this period, a coherent reading of his poems and plays shows it to be the case." To portray the history of an age in language and scenes - this too is the the mark of a classic author. When we speak of Brecht, the "Modern Classic", we are not placing him in a museum, but understanding how he developed and the influence he exerted.